Thursday, January 18, 2018 (breakfast and lunch included). You won’t want to miss this engaging event designed to motivate and inspire you in teaching arts education. Who should attend: teachers, administrators, after school staff, board members and cultural arts groups. Workshops will include hands –on activities in art, dance, drama and music designed to help teach students of all ages to discover and develop creativity. The cost is $40.00 early bird, per person, space is limited to 120 participants. After December 15, 2017 the cost is $50.00 per person. Register today: Click here for the flyer to register - https://goo.gl/6nD4uy. 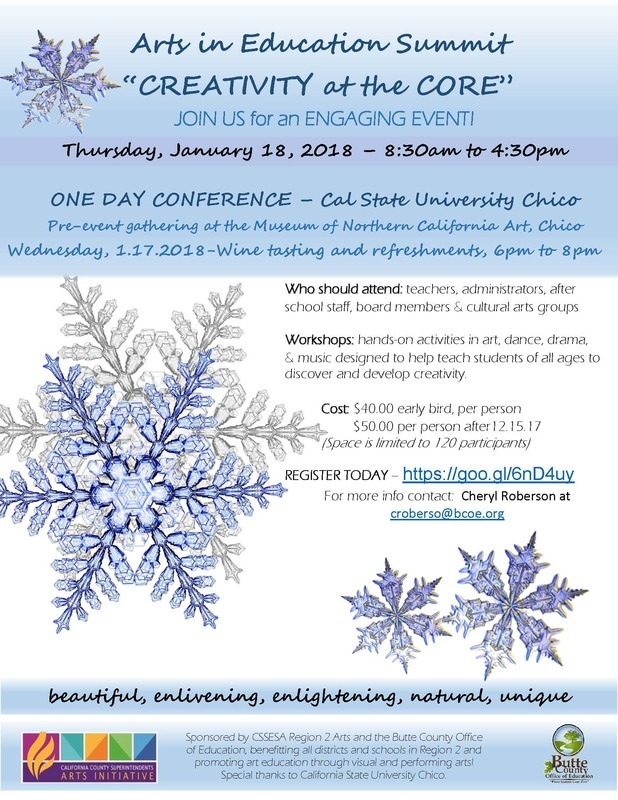 A pre-event gathering will take place at the Museum of Northern California Art in Chico on Wednesday, January 17, 2018 from 6pm to 8pm with wine tasting and refreshments. For more information please contact Cheryl Roberson at croberso@bcoe.org. Both events are sponsored by CSSESA Region 2 Arts and the Butte County Office of Education, benefiting all districts and schools in Region 2 and promoting art education through visual and performing arts!